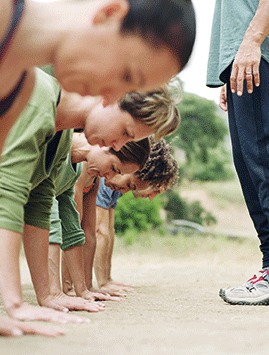 Whether you’re hoping to lose a few pounds in time for summer or wanting to improve your fitness levels, a military-style bootcamp could be just the thing to kickstart your health and fitness regime. Although the idea of a bootcamp may conjure up images of an intimidating army captain barking orders, these types of fitness classes have grown in popularity with devotees all over the country. The advantages to military bootcamps are that they tend to be aimed at people of all fitness abilities, they are held outdoors – so you get the benefits of working out in the fresh air – they require very little equipment and they provide encouragement and motivation to stick to your workout goals. These group workouts tend to focus on bodyweight exercises like push-ups, squats and sit-ups, as well as moves to improve your speed, strength, agility and stamina. Some, like the GI Jane Bootcamp (www.gijanebootcamp.co.uk), are solely aimed at women, and involve a residential stay of three, four or seven days, whereas others, like British Military Fitness (www.britmilfit.com) hold regular weekly classes. Before signing up, it’s a good idea to research the options that are available in your local area, to find a class that is suited to your fitness levels and abilities. Some offer a free trial session, which is a great way of trying out the class before you sign up. Most bootcamps do not require any special equipment, but be sure to dress appropriately in comfortable workout clothes and trainers, and make sure to bring a bottle of water with you as you’re guaranteed to be sweating! Make sure your body is properly fuelled for exercise, by eating a healthy snack about an hour or two before your bootcamp begins – low fat yogurt with granola or berries is a good option. And, after you’ve finished, help your body to recover properly with a carb and protein-packed snack such as some nut butter or a banana with some oatcakes. So, if you’re looking for a high energy workout that will challenge your body and keep you motivated, why not check out a military bootcamp? It could be just the thing you need to achieve your fitness goals. Carol now attends three sessions a week in Graves Park, Sheffield, and has also completed a number of fitness challenges including the Major Series in Leeds, a 10km obstacle course as well as various 10km races.